Bedford’s Christmas Lights Switch On event will take place on Thursday 23 November, at 7pm, along The Embankment. 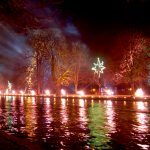 Everyone is invited to attend this free Christmas event when Bedford Borough Council will light up the town with another magnificent firework display to mark the start of the Christmas period. Entertainment before the switch on, organised by BedfordBID, will take place from 3pm – 7pm in Harpur Square and will include a snowboard simulator, Christmas balloon modelling, a Cairngorm reindeer and lots of Christmas games. Father Christmas will be at the switch on event, so get there early to get a good spot and help welcome him to Bedford! There will be free late night parking at the Harpur Centre and Council-owned car parks (except River Street) from 6.00pm on the 23rd November. The Christmas Light Switch On will also mark the beginning of late night parking in Bedford Town Centre. Further information on any other Christmas related events can be found here.